Fall Fashion is in full swing! While the temperatures are just now starting to cool down, fashion is starting to heat up. Now is the time to start investing in those perfect crossover shoes. And the mule is really having a moment! When I was in middle school, I had a friend that made fun of me for wearing chunky mules to school. She even had a nickname for them, clodhoppers! Needless to say, when I first saw the term mule to describe these ever so sleek and chic Calvin Klein slip-ons, I was a bit taken aback. 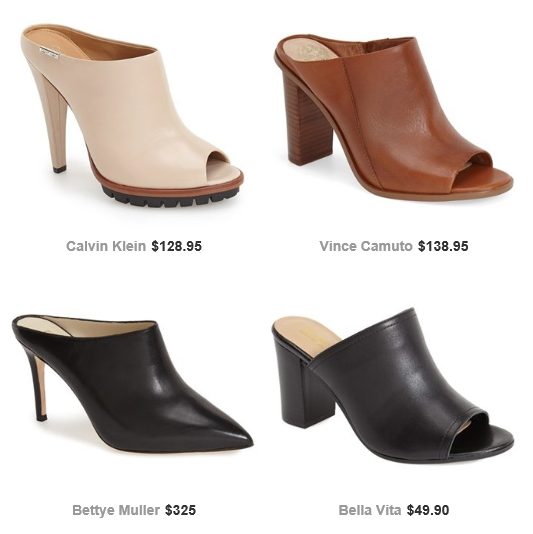 When did mules get a makeover? And can I rock these with my Fall wardrobe? I am here to tell you yes. And if the photo above doesn’t convince you of such, check out my favorite style picks for the mule trend! Still confused on how to be stylish in mules? Get some inspiration from Popsugar. BamBe Bamboo Earth Friendly T-Shirts!